This is the most powerful technique for you to be able to clearly communicate with the universe so that you can manifest and create the life that you truly desire. It all comes down to learning how to communicate with the universe. Here's the most powerful technique for how to communicate with the Universe. Think of the universe as the energy substance that creates everything. If you have a powerful enough microscope and you look at a wall, what do you find out about the wall? It's not a solid object. It's energy. What about this body? This meat suit? It's energy. Everything is energy moving at different rates and speeds of vibration moving so quickly. That's what our limited physical senses tell us. Things appear to be solid objects and we've been conditioned to believe that they're solid objects. The Universe is an intelligent energy that orchestrates everything physical and nonphysical and its consciousness. When you can become aware of it, you begin to move into harmony with it, so the greatest technique and way for you to connect with the universe and align with the universe and communicate with the universe is adoration of creation. Your life is adoring the fact that you're alive. You're here in this world that we have all of these things because what you're doing is having the absolute reverence for God. Most people are in the opposite type of energy and consciousness. We connect when we appreciate. When we're in that energy, we are literally in a place where we're not acknowledging the perfection of the universe. We're not acknowledging the divine intelligence. We're unaware of it. We are unaware of the perfection. Spirit never manifests itself other than perfectly, and when you start to realize that, you connect with spirit. When you start paying attention to the beauty of creation, when you start really paying attention to the universe, when you start really paying attention to the conscious intelligence that governs all things, you can feel it because sometimes you get the chills. Sometimes you can just feel the energy start to pick up in your body. It feels stronger. That's when you're connected. Your connection to the universe is going to get stronger and stronger and you can start stating all of your intentions and desires and you will see them start to show up in your life. Why? Because you're no longer offering resistance to your connection to the universe. We're always connected to the universe. It's just that our conditioned mind is generally offering resistance to it because we're wishing things other than the way that they are. We're lost in our thought patterns and in our limitations. We think we're just this little physical body and therefore we disconnect ourselves from the spiritual dimension. When you're in this heightened level of consciousness, that's when it's so easy to state all of your intentions. I'm so grateful. There's no resistance because I'm really connected to it right now. The universe hears that and then it starts to respond and bring more people in, more circumstances and situations. I'm so grateful I'm getting the perfect resources for my goals and my dreams. Thank you universe. I'm so grateful that I'm attracting great romance and I'm meeting the perfect people for me. Thank you universe. That's how you do it. You get in a heightened state, five things every single day. You write them down that you love about the universe. It's going to forge a deeper connection with the divine intelligence. When you're in that heightened state, you can begin to clearly thank the universe for things you intend to manifest and because there's no resistance, they will show up in your life quicker and faster. I promise you this. Use this experiment and see the amazing things that shift your life. 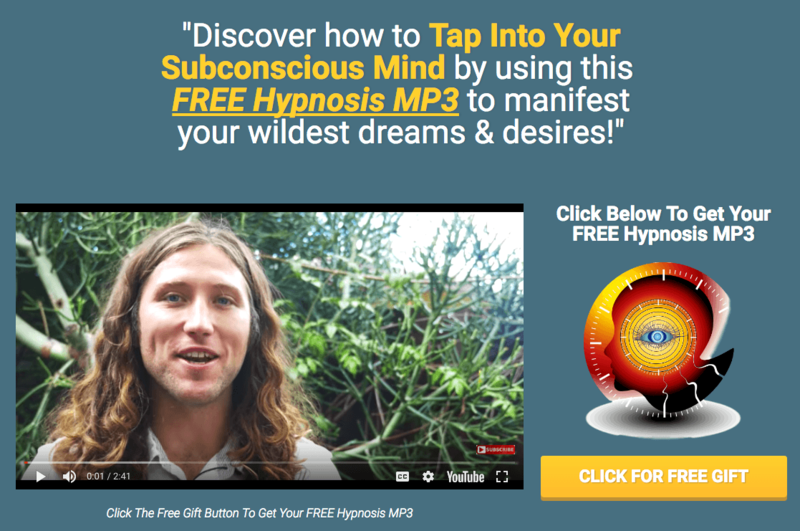 If you have not yet, make sure that you download my free success hypnosis down below. It will rewire the subconscious and eliminate any of that negative resistance which will allow you to attract what you want quicker and faster. It's free. Over 200,000 people from all over the world have used it. Be sure that you demo my software, The Second Mind. It's a free software to rewire your brain. Download that software down below to begin to change your life. You can create the life of your dreams. Download my free software down below. Have a beautiful day and I cannot wait to hear about the amazing things and unfolding your life using this technique.